A concert was scheduled Will's Pub (1042 N Mills Avenue), but at the last minute, Mark Sultan (of King of Kahn and BBQ), the leading act canceled. The $8 cover was dropped to $3 which was enough to entice me out to do a sketch. When I got to the front door I found out the cover had been dropped all together. I was issued an orange wristband. 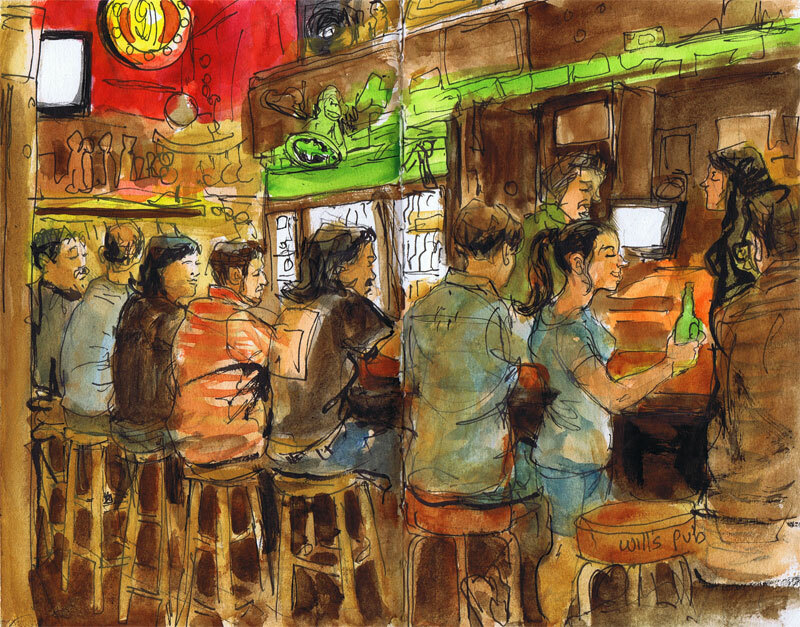 I ordered an Orange Blossom Pilsner and sat at a side table to sketch people as they lined up at the bar. It seemed like so many friends were reuniting. Dollar bills were hung with care behind the bar. Bottled beers glistened inside the coolers. After I was done sketching, I immediately packed up to go, because I knew Terry was waiting at home. As I walked out I noticed The Golden Pelicans, were set up and ready to perform on the main stage. This was a prime sketch opportunity, but it was time to be getting home. Tight Genes were going to perform as well later that evening.